Gold fell Tuesday for the second straight day, moving below $900 an ounce and losing $46.80 already on the week. Silver, gold and oil also declined while U.S. stocks rallied. For the daily numbers, New York silver, gold and platinum futures lost 3.1 percent, 2.4 percent and 1.9 percent, respectively. The Dow and S&P stepped out of Monday’s 12-year lows, surging 5.1 percent and 5.8 percent, respectively, with around 30 minutes of trading left. The Nasdaq was up 6.3 percent. Crude-oil for April delivery lost $1.36, or 2.9 percent, to close at $45.71 a barrel. The average price for regular unleaded gasoline declined four-tenths of cent to $1.941 a gallon, according to AAA. March silver declined 40 cents to close to $12.54 an ounce. 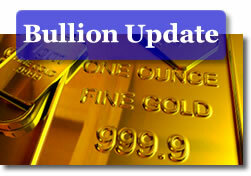 Gold for April fell $22.10 to end at $895.90 an ounce. "Gold as an inflation hedge is not working right now because of the deflationary pressures," Paul Schulte, head of multi-strategy research at Nomura International, said in a Bloomberg Television interview today. "As people de-leverage, they’re forced to sell assets to repay debt. That deflation counts against gold." In spot trading, the London afternoon gold-fixing price — a benchmark for gold traded directly between big institutions — stood at $901.50 an ounce. London silver and platinum were at $12.71 and $1,041.00, respectively. Check out additional market resources at Live Spots, the Silver Coin Melt Calculator, U.S. Mint Collector Bullion Price Guide, and the Inflation Adjuster.